If you’re like us, you want to make the most of the Central Valley’s phenomenal weather to enjoy some quality time on the porch, patio, or deck. Why not do so in style? That’s why the area’s premier discount furniture seller, Oak & Sofa Furniture Liquidators, offers you a stunning selection of outdoor furniture options including complete dining sets, other smartly designed outdoor seating, ample outdoor umbrellas, and for added atmosphere when the temperature dips a bit at night, beautiful fire pits that operate at the touch of a button and reliable outdoor heaters so you can keep the party going. Better still, with us you can outfit your patio or poolside party while remaining well within your budget. With more than 50 outdoor seating selections from us, you are sure to find the pieces that are ideal for your alfresco dining or drinks parties, from wicker-look sectionals, sofas, and ottomans with sturdy construction underneath to swivel chairs and the benches popular with youngsters. 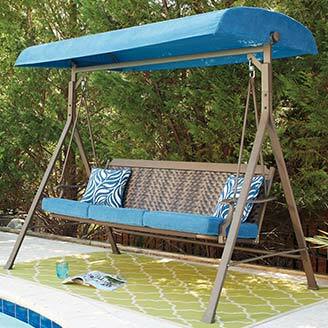 And don’t forget that perennial poolside favorite, the chaise longue for sunbathing and reading. 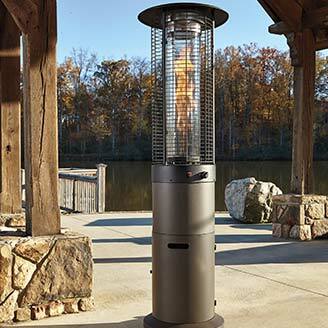 Ours features weather-resistant cast aluminum construction and cushioning that withstands years of use thanks to Nuvella high-performance fabric. A light outdoor swing might be just the thing for a romantic setting. With Oak & Sofa Liquidators, the only limit to your fine outdoor seating is your imagination! There is too much of a good thing, as the first sunburn of summer makes clear. When you don’t feel like putting on more sunblock and the midsummer rays get a bit oppressive, or a sudden squall pours down on your gathering, never fear! One of our massive cantilever umbrellas easily opens to give you and your guests much appreciated protection. Yes, you CAN afford great outdoor furniture. Why wait? Check out the links on this page, then swing by our Fresno, CA discount furniture store or any of our other Central Valley stores to make your vision of the perfect yard, patio, deck, or poolside furniture a reality.